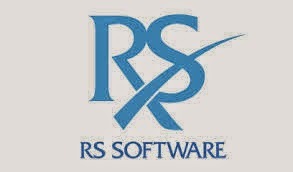 RS Software is a medium size software company based in Kolkata. The company's major focus is on the online payment industry since it's inception in 1991. Apart from this, the company also indulges in development of application for Software companies. Let's start of with a peek into the company's financials. The company's revenues are growing at a 5 year CAGR of 16.29% from Rs. 149.57 crores in FY 08-09 to Rs. 318.16 Crores in FY 12-13. The company is able to sustain a good growth in revenues, the YOY growth bein 20%+ from the past 3 years. This is complimented by the healthy margin being maintained. The company continues to be a ZERO-DEBT company. The reserves of the company have risen from Rs. 8.79 crores in FY 08-09 to Rs. 111.79 Crores in FY 12-13. The equity of the company is around Rs. 12 Crores. For the 9 Months ended Dec '13 the revenues of the company were Rs. 265.37 crores and profit after tax Rs. 35.18 Crores. The net profit margin was 13.5% approx. We await the 12 months result for the company and as per our view the company could report revenues for the 4th quarter at around 80-85 crores which means that the revenue for the 12 months ended 31st March, 2014 stand at Rs. 345-350 crores. But instead of speculating the results we need to look at the bigger picture. The overall fundamental valuations are very attractive for this mid-size software company which has a market cap of around Rs. 235 crores. 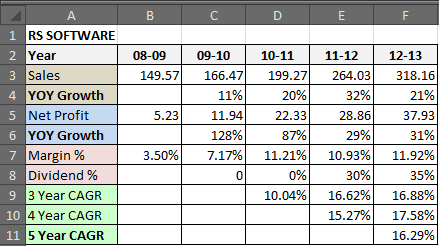 Of the 61.5% public shareholding, just 6.5% is of FII's and Mutual Funds. From various platforms on the internet and after reading the views of employees, we have noticed that the company is a family run business, though the employees are generally satisfied. This point again has been noted from reviews of ex-employees and current one's that the company has few large projects on which the major chunk of the revenue depends. This means that if the company looses any of it's big projects, there can be a sharp fall in the revenues. We have personally entered the stock this month and would like to wait for this years results and annual report for a stronger view. Overall, we are bullish on the long term prospects of this stock and would add it to our long term portfolio. This post may be updated at later stages as news and views develop.